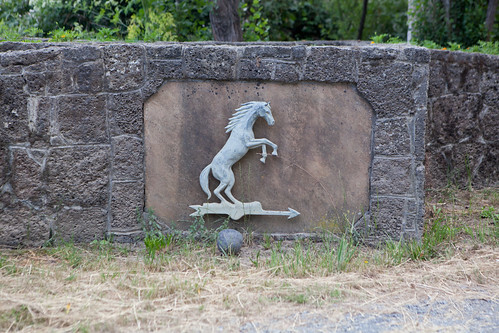 Iron Horse is one of the most prestigious, small, independent, estate, family owned wineries in the United States. 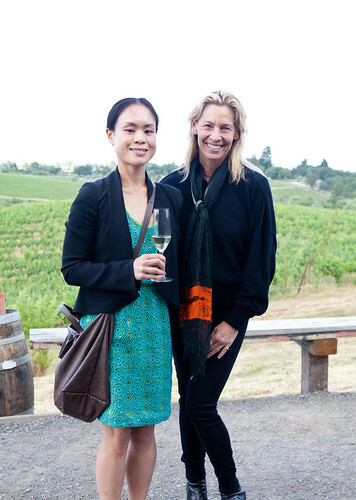 For the past few years, I’ve been corresponding to the CEO of Iron Horse Vineyards, Joy Sterling since I’m a fan of her family’s sparkling wines and I thought it would be great (and an honor) to actually meet her in person. 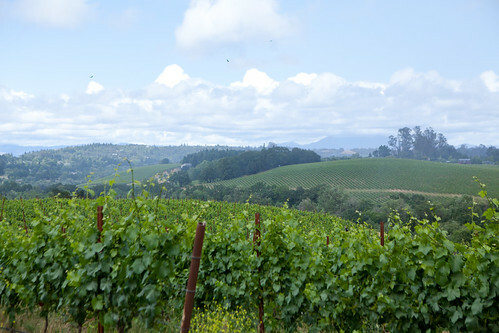 I’m used to seeing vast green fields whenever I do visit any winery estate but I didn’t anticipate the drop-dead gorgeous landscape at Iron Horse Vineyards when my family and I were in the Napa/Sonoma Valleys in early June. Rolling green hills, bright blue skies with puffy clouds coming out after a short shower of the day, and a grand view of Mount St. Helena on the horizon. 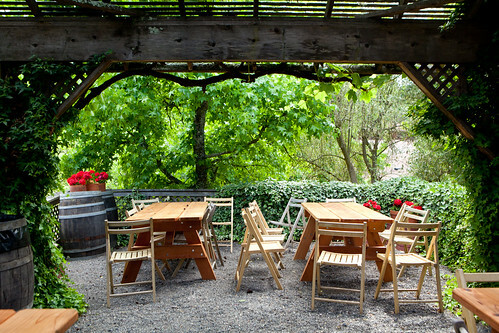 We met Joy Sterling at the tasting room where it was buzzing with other visitors who indulged in the views, sip on their delicious wines, and inquire on Iron Horse’s various offerings of sparkling wines and Pinot Noirs with the staff. Joy’s mother named her well, as Joy is a joy to be with. 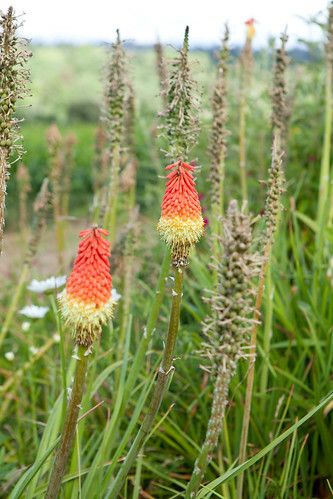 She’s elegant, savvy and her vivacious personality is like a beam of California sunshine. 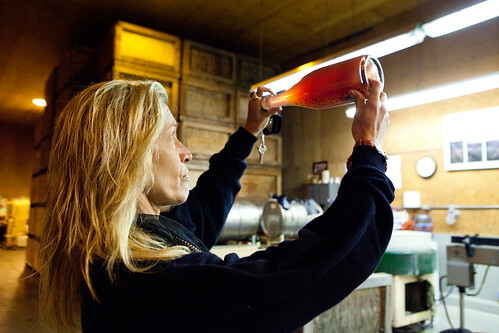 Joy started us with the Golden Gate Bridge Limited Edition Cuvée 2007. 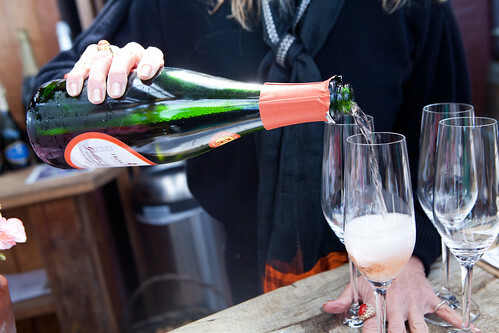 It is a special, limited production, vintage rosé commemorates the 75th anniversary of the Golden Gate Bridge. Iron Horse co-founder Audrey Sterling (Joy’s mother) walked across the bridge opening day with her father when she was six years old. It is composed of 88% Pinot Noir grapes and the remainder is Chardonnay that spent seven days soaking with their skins, giving the wine a rosy hue that is reminiscent of the sun setting over the iconic structure. 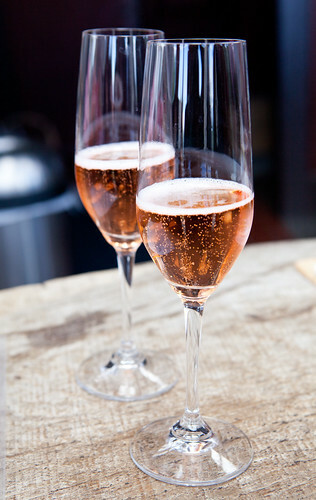 Fine, clear stream of bubbles and notes of luscious red fruit. 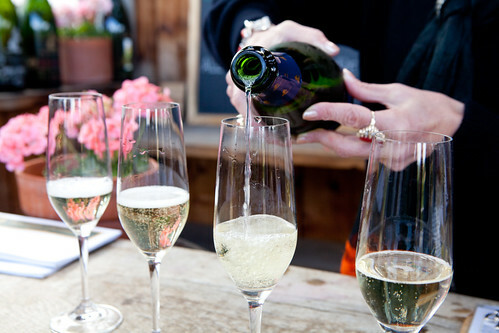 It’s a very fine way to toast to the Golden Gate’s birthday and her mother. 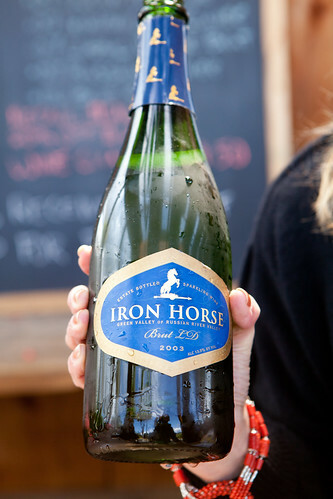 The next round of bubbly we tried was the Iron Horse Brut LD 2003. (The LD means late disgorged.) 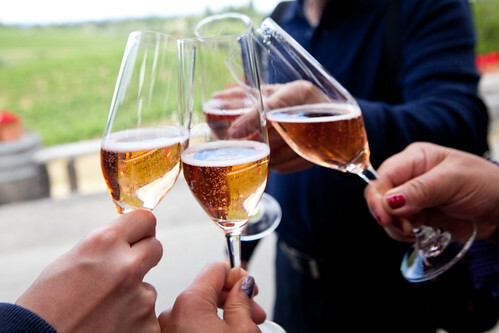 The crisp, dry wine has enormous strawberry, raspberry, orange and lime flavors, with an exotic spiciness. It’s delicious. 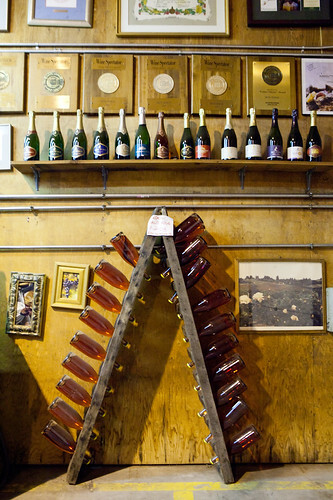 After getting fueled up by these wonderful wines, Joy took us to one of the estate’s buildings where they ferment and possibly bottle their cuvées. 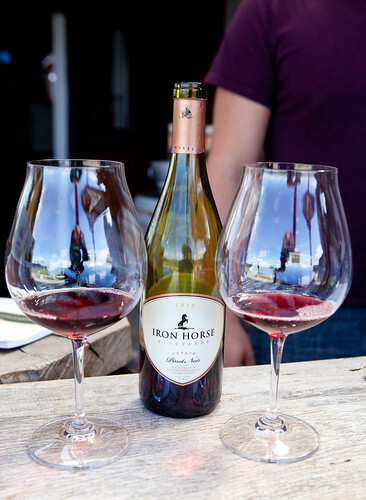 She informed us that Iron Horse has 160 acres in vine, planted exclusively to Chardonnay and Pinot Noir. They are re-planting 50 acres of Chardonnay and Pinot Noir, hoping to kick up their wines a few more notches toward excellence. 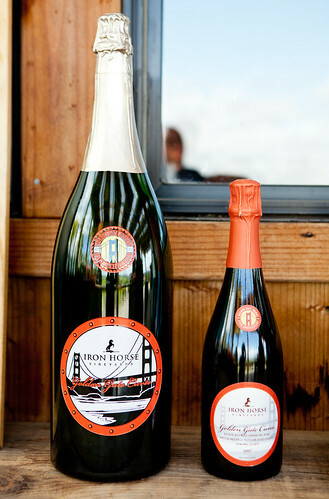 Iron Horse wines are developed as both an art and a science – and all were paid close attention to detail. 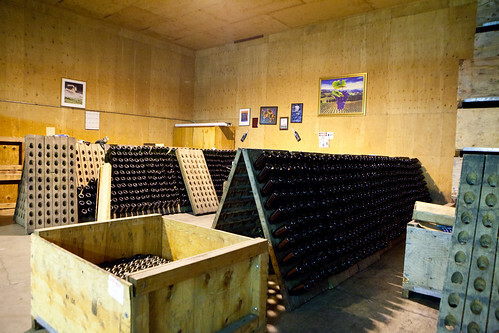 Fermentation, time, the type of yeast to ferment the wine, dosage, and even down to the type of composite cork they use for bottling (the winery only uses corks made from the cork tree’s branches so it would keep their wines pristine and delicious). Shortly, we walked to what Joy lovingly called this the “Board Room.” If I had this as a board room, I don’t mind coming to work and have meetings here. It’s too darn beautiful here. 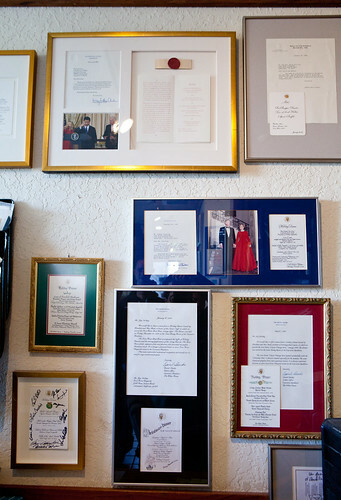 Then we headed toward her sales office where the entire wall is filled of the White House dinners that served Iron Horse’s wines – starting with former General Secretary of the Communist Party of the Soviet Union Mikhail Gorbachev in 1989. Joy remarked that this dinner “placed Iron Horse on the map.” (Please see the video clip above.) Since then, the White House has invited Joy and her family over the decades for various dinners and luncheons. 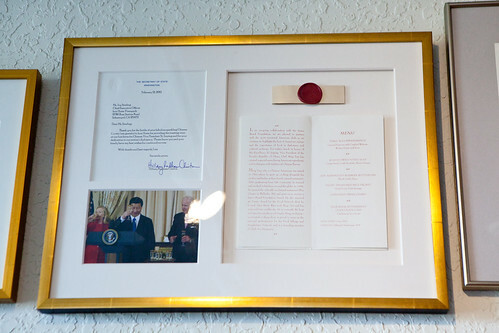 The most recent one was the Iron Horse Chinese Cuvée 2007 was the toasting wine at the lunch for Chinese Vice President Xi Jinping, hosted by Vice President Joe Biden and Secretary of State Hillary Rodham Clinton on February 14, 2012. Before Joy and my family parted ways, I’ve asked for our photo taken to remember this amazing experience. 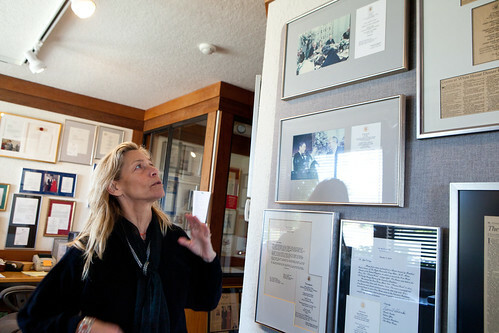 It’s such a pleasure to meet her and see the magnificent winery in person. I was curious about Iron Horse’s still wines and wanted to tried out two different pinot noirs before we leave. 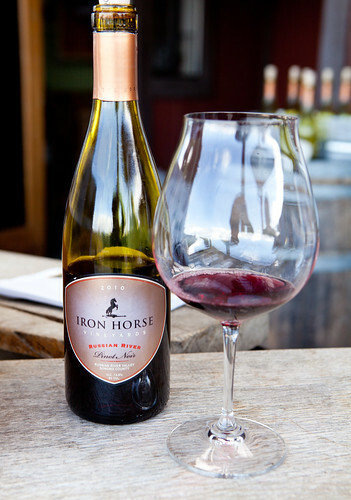 I started with the Iron Horse Estate Pinot Noir 2010. 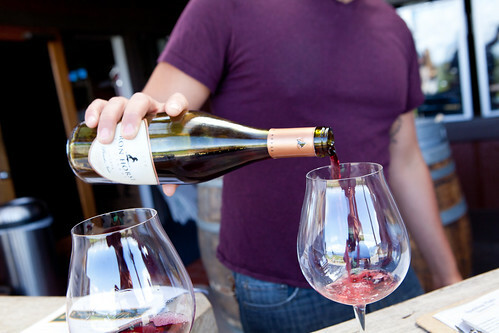 Flavors and aromas of black currant, strawberry and cherry. Very fruit forward, with light acidity and body. 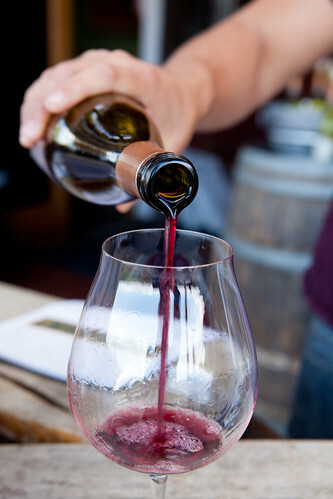 The final glass of wine for the day was the Iron Horse Russian River Pinot Noir 2010. Lovely aromas of raspberry jam and smoke, then there’s this carmelized sugar aroma of creme brulee and cloves mixed together. Significant tannins, but they feel plush. The fruit tastes sweet, but not too jammy. This is a bigger pinot than the Estates pinot and it’s very delicious.